This painting is finished. It is 28x48" or 70x120cm. This is the top bit, if you want to see the rest of the painting, then please come to my Open Studio Days where it will be on display! There will be lots of original paintings to see, most for sale, greeting cards (hand drawn and printed), prints, and plenty of little lace goodies. 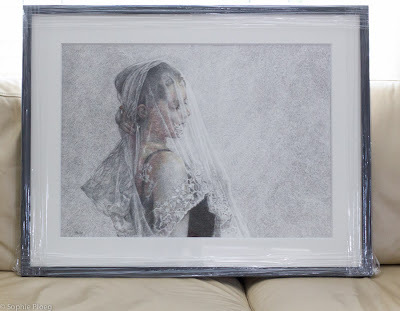 You can can come and have a chat, see my materials (paints, lace and fabrics etc). 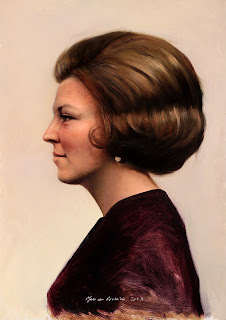 I will also have some portraits on show. If you are interested in commissioning a portrait, do not hesitate to ask how, how much, when etc. Pop in, any time between 10 and 5 on Sunday 5 May, 6 May (Bank Holiday Monday) or Sunday 12 May (last day). Be early if you want choice! 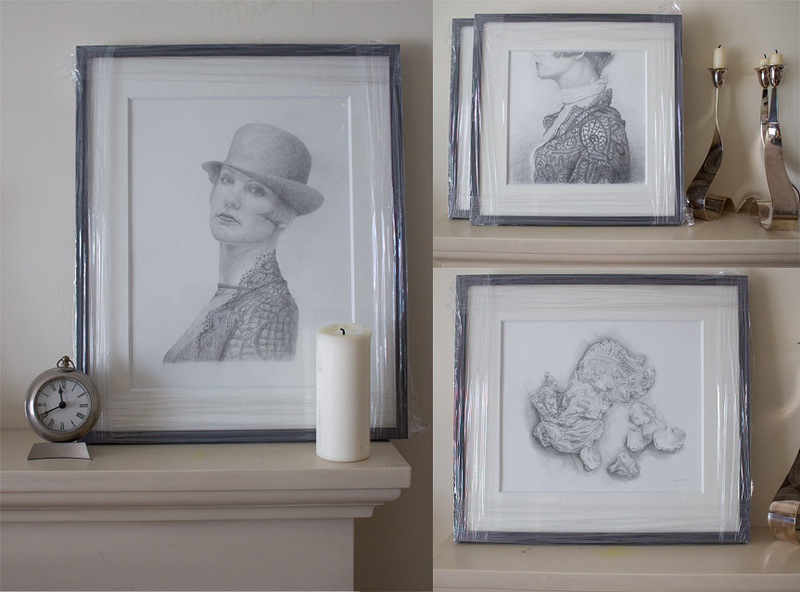 I had these drawings framed in a nice grey hand painted frame. The ultimate Salon des Refusés, where almost all of the best figurative/realistic portraits of Queen Beatrix of The Netherlands come together. 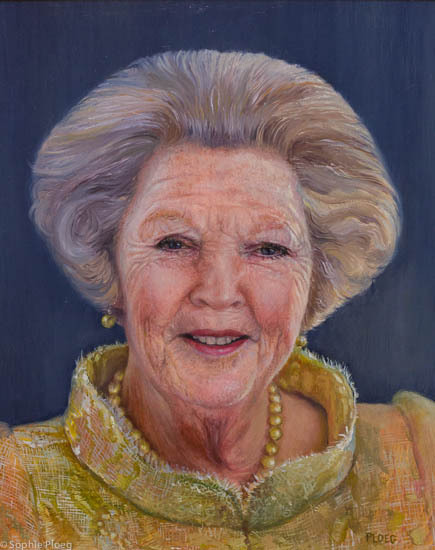 An exhibition of portraits opens 28 April and runs until 31 August. 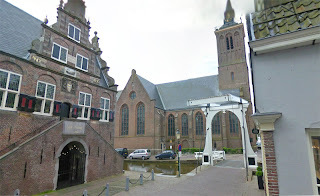 Grote Kerk in De Rijp, Holland. Jos van Riswick's oil painting of Beatrix. I've been fairly busy with creating small drawings for my greeting cards, and making small reproductions of my paintings. The initial cause of this was my upcoming Open Studio Days (where cards are always popular) but I have now opened an Etsy online shop where you can buy cards, prints and other goodies (see in the right side bar). Of course you can still get those direct from me as well. 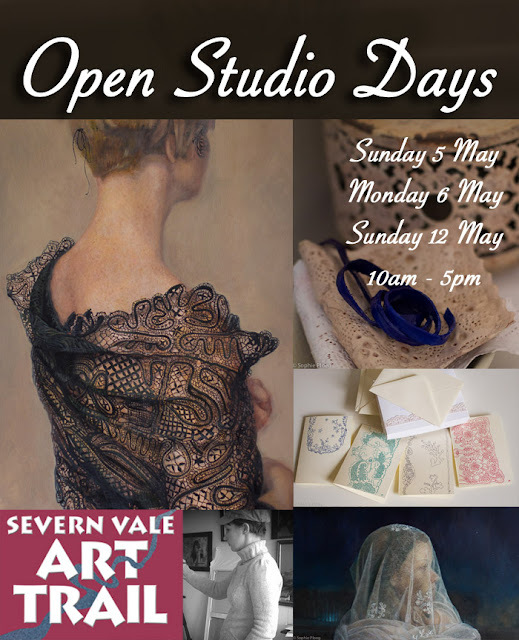 For my Open Studio (5,6 and 12 May) I enjoy the preparations of providing something new, something affordable and something enjoyable for visitors, besides my paintings of course! 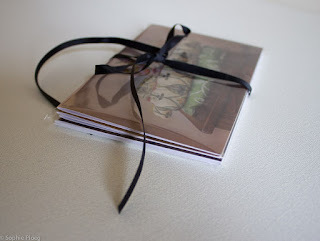 I am making all sorts of little goodies for lace lovers and art lovers alike. Can't possibly show them all here - it will have to remain a bit of a surprise until the Open Days. Suffice to say it is all lace related. 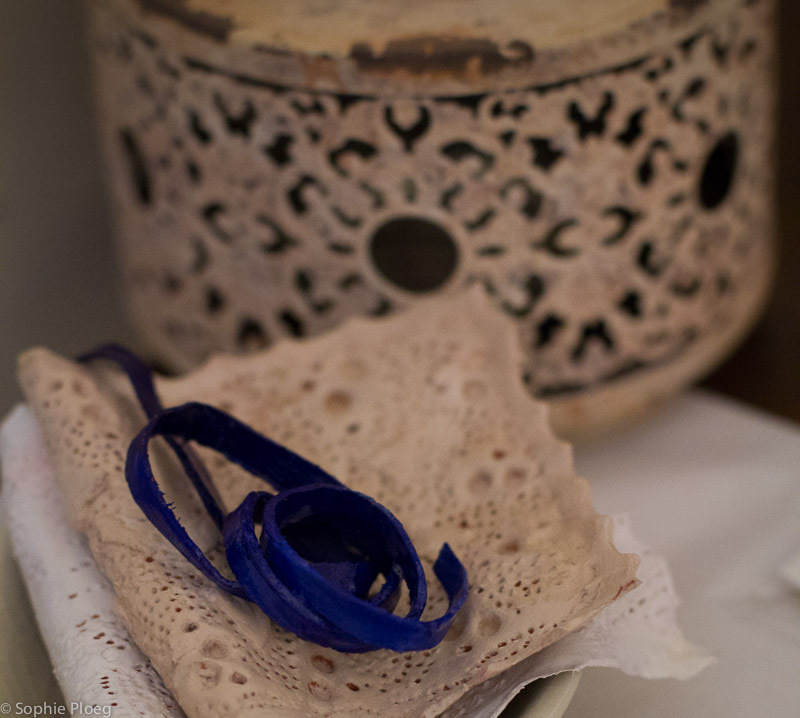 I am really diving into the history and variety of antique lace at the moment. Browsing the internet, reading books etc. Victorian and Edwardian lace is still very much around these days, but the costumes and lace visible in seventeenth century portrait paintings is also a topic of great interest to me. 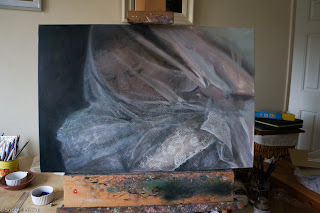 I have two paintings on the easel at the moment. The larger one you saw in the last blog post and a smaller painting with the same lace veil featuring in it. I have so many paintings waiting to be painted in my head I just cannot find enough hours in the day to get it all onto canvas. I hope you like what does make it out of my hands! 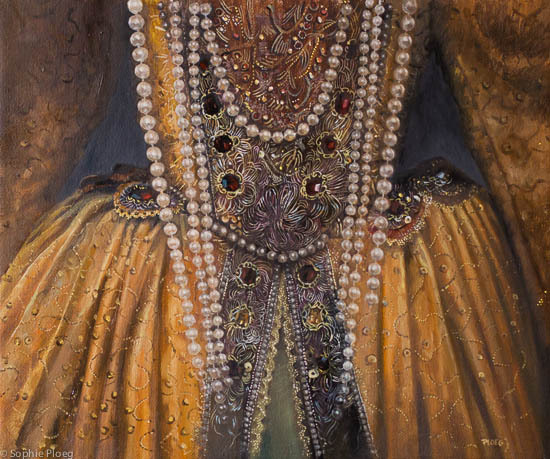 The next month will be submitting-month: lots of Open Exhibitions to submit to and hopefully some of my paintings will get accepted by the judges to be shown in fabulous shows. 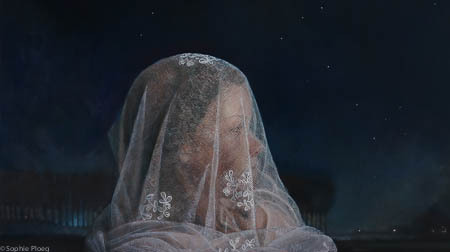 The Royal Society of Portrait Painters has 2 rounds to get through and 2 paintings managed to get through the first round, so keep your fingers crossed for the final round. 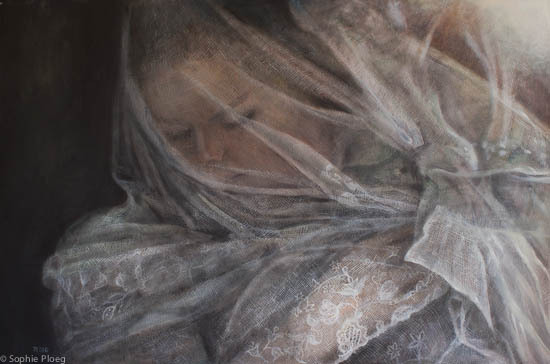 It is tough going this year as the Society had a huge amount of submissions because of their new Self Portrait Prize attracting many submissions. 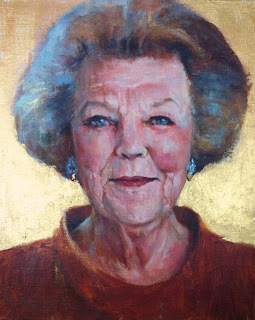 For my Dutch friends I do have one hint of news (more about this at a later date): my little portrait of Queen Beatrix is going to be exhibited in de 'Grote Kerk' in the lovely village of De Rijp in North-Holland in an exhibition named 'Met het Oog op Beatrix' ("Beatrix in the Picture" is my very free translation). 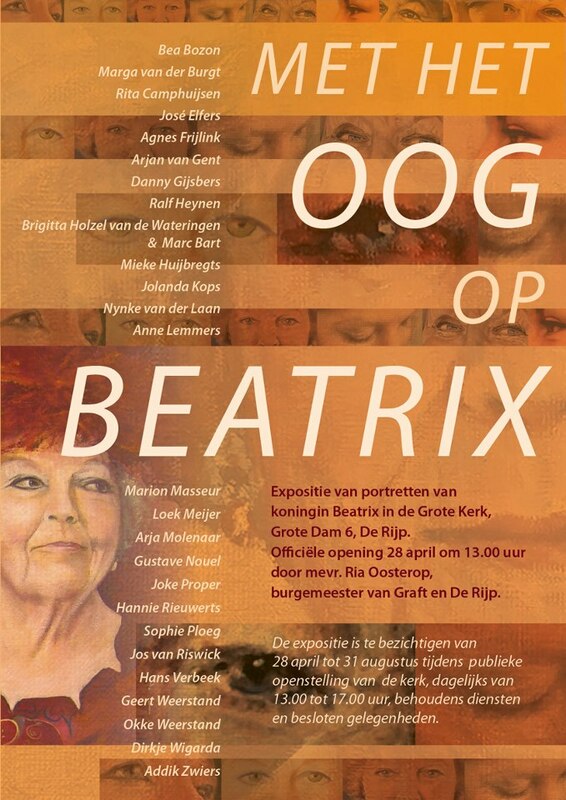 Organised by fellow artists (a 'salon des refusés' from the more conceptual tinted Beatrix exhibition at the Palace Het Loo), it is an exhibition with around 20 works of art featuring the queen, who, of course, will abdicate on 30 April. The Exhibition will be a nice farewell. 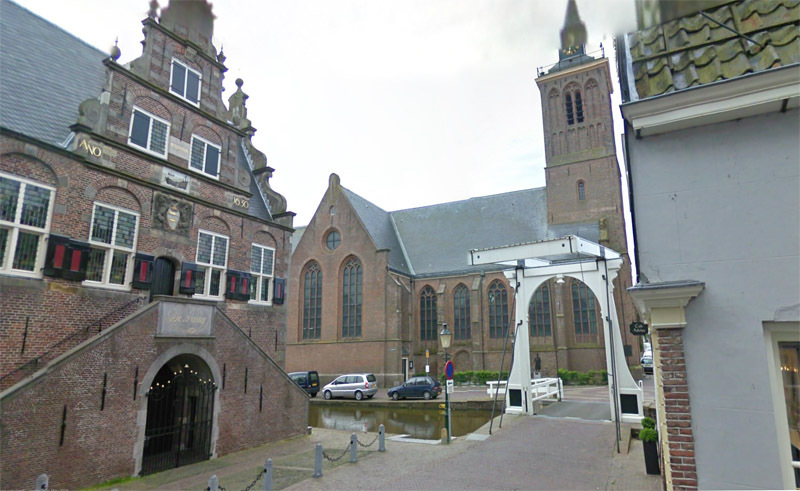 It will open on 28 April and run until 31 August. Please visit my blog on my website http://www.sophieploeg.com/blog to read my latest posts. Thank you!